Using the months of the year in Spanish and English, the award-winning team of Sherry Shahan and Paula Barragán (Spicy Hot Colors and Cool Cats Counting) join forces to create this vibrant picture book celebrating Latin American holidays. Each month of the year features a spirited poetic interpretation of a Latino holiday tradition, along with an explanation of the custom supported by colorful illustrations. August House is giving away 5 free copies of Fiesta! to celebrate the holidays. To win, send an email to steve@augusthouse.com with the subject line “Fiesta!” and write two sentences about how you plan to use this classic picture book in your school. Please include your mailing address. Listen to Sherry Shahan’s author name pronunciation recording. Dorothy Hearst’s engaging Wolf Chronicles novels, Promise of the Wolves, Secrets of the Wolves, and Spirit of the Wolves, are set 14,000 years ago and explore the bond between wolves and humans. Weaving in elements of mythology from many cultures, the novels are told from the perspective of Kaala, an outcast young female wolf who has been charged with watching over humans. Simon & Schuster is giving away 3 sets of the three novels in The Wolf Chronicles. To enter to win, send an email to WolfGiveaway@gmail.com with the subject line of “Wolf Chronicles” and please include your mailing address. Enjoy the reading group guide for Promise of the Wolves. Cody, Quinn, Luke, and M.E. love playing around with codes. In fact, they love codes so much they have their own club, with a secret hideout and passwords that change every day. Egmont USA is giving away 5 copies of The Code Busters Club, Case #4, The Mummy’s Curse by Penny Warner. To enter to win, send an email to michellebayuk@egmont.com with the subject line of “Code Busters Club on TeachingBooks.net” and please include your mailing address. Check out character profiles on the series website. A fantasy adventure in the vein of A Wrinkle in Time and When You Reach Me, Amy Herrick’s story begins when Edward picks up what he thinks is a rock—but is really a Time Fetch that causes a dangerous time rip. Only Edward and a band of three mismatched classmates who have touched the Fetch can see what is happening, so it’s up to them to repair the entire fabric of space and time. Now in paperback. Algonquin Young Readers is giving away 5 copies of The Time Fetch. To enter to win, send an email to algonquinyr@algonquin.com with the subject line of “Time Fetch giveaway” and please include your mailing address. Get ideas on how to incorporate The Time Fetch into your curriculum with this educator guide. The familiar story of this American hero is told for children. From Dr. King’s birth to the end of his short life, the values that he stood for so powerfully and the changes that he helped to bring about are presented here in terms that children can understand and personally relate to. Let’s Celebrate Martin Luther King Jr. Day is one of five titles in the Holidays & Heroes series with more titles to come. Kane Press is giving away 10 paperback copies of Let’s Celebrate Martin Luther King Jr. Day. To enter to win, send an email to info@kanepress.com with the subject line: “TeachingBooks Martin Luther King Jr. Day” and please include your mailing address. Use Barbara deRubertis’ author name pronunciation to help introduce the book in your classroom. The Grinch, whose heart is two sizes too small, hates Who-ville’s holiday celebrations, and plans to steal all the presents to prevent Christmas from coming. To his amazement, Christmas comes anyway, and the Grinch discovers the true meaning of the holiday. 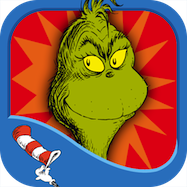 In honor of Grinchmas, Oceanhouse Media is giving away 5 promo codes for Dr. Seuss’s How the Grinch Stole Christmas! digital book app for iOS. To enter for a chance to win this classic holiday tale, please send an email to press@oceanhousemedia.com with the subject line of “Grinch Giveaway.” No need to send physical addresses; the prize is digital only. Preview the How the Grinch Stole Christmas! book app and listen to an audio sample. Inkshares is giving away one copy of The Cat’s Pajamas by New York Times bestselling author of Big Fish, Daniel Wallace. This illustrated children’s book introduces us to Louis Fellini, a kitten who dares to dress differently in a world full of copycats. To enter to win, send an email to angela@inkshares.com with the subject line of “The Cat’s Pajamas Contest” and please include your mailing address. Explore individuality and idioms in The Cat’s Pajamas with this discussion guide. Two young brothers leave their Tibetan village to escape from the brutal and repressive Chinese regime. With India as their ultimate destination, they miraculously make their way across the treacherous Himalayas only to face the cruelty of border police and an unfeeling bureaucracy that threatens to destroy their dreams of freedom. Annick Press is giving away 3 copies of Escape from Tibet: A True Story. To enter to win, send an email to brigittew@annickpress.com with the subject line of “Escape from Tibet Giveaway” and please include your mailing address. Share the story behind Escape from Tibet: A True Story, watch the author interview. Do you want to be an Animal Helper? This non-fiction series goes behind the scenes with animal caretakers to show the rewarding careers that are perfect for any animal lover! Learn how rehabilitators help a squirrel with a broken leg, or raptor centers prepare injured birds to fly again. Go into the zoo with keepers and learn about animal enrichment or research being done in aquariums on some of the world’s craziest creatures. Author Jennifer Keats Curtis worked with rehabilitation facilities, zoos, aquariums, and sanctuaries around the country to get a glimpse into their world. Inspire animal helpers in your classroom with this teaching guide. Enter to win a copy of Game World, an adventure novel in a video game turned reality, with giant spiders, malevolent hummingbirds, a not-quite-yellow-brick road, and preteen children learning how to be heroes! Akashic Books/Black Sheep is giving away 5 copies of Game World by C.J. Farley. To enter to win, please send an email to susannah@akashicbooks.com with the subject line “TeachingBooks.net: Game World” and please include your mailing address. Learn more about C.J. Farley and Game World with audio and video author interviews. Disney Publishing Worldwide is giving away 10 copies of Gracefully Grayson. To enter to win, send an email to childrens.marketing@disney.com with the subject line of “Gracefully Grayson/TeachingBooks” and please include your mailing address. Engages students in discussion about Gracefully Grayson with this Common Core guide. Author-illustrator Harry Horse tells this hilarious, original story through a series of letters written by Grandfather to his grandchild back home. Horse’s winsome pen-and-ink illustrations capture the charmingly eccentric personalities of Grandfather and his dog Roo and the amusing calamities that befall them. Peachtree Publishers is giving away 10 copies of this fanciful tale! To enter to win, send an email to niki@peachtree-online.com with the subject line “Last Polar Bears Giveaway” and please include your mailing address. No P.O. Boxes, please. Want to learn more about Harry Horse? Visit the author’s personal website. As featured in the New York State Education Department’s Expeditionary Learning ELA curriculum, in support of the Common Core, “A wonderfully fast-paced and engaging primer on the key questions surrounding fish and the sea. Great for a classroom,” Paul Greenberg, author of Four Fish. Workman Publishing Company is giving away 35 copies of World Without Fish. To enter to win, send an email to mrockliff@workman.com with the subject line of “World Without Fish” and please include your mailing address. Add multimedia elements to your lesson using this Meet-the-Author Book Reading with Mark Kurlansky. Now hear the adventures on CD! Visit The Seven Sequels series website for book trailers, book descriptions, and author bios. Love Teachingbooks.net contest! Learn about all kinds of great books. Thank you for doing this! This is a wonderful way to get books in librarians or teacher’s hands at a time when budgets continue to be cut. Thanks so much. This is awesome!! TeachingBooks.net is a great site to use and the contests give us the opportunity to gain a few more books that our “small” budgets can only stretch so far. Thank you very much.